Our master bathroom makeover is chugging along – this week, we refinished our bathtub using Rust-Oleum’s Tub & Tile Refinishing Kit. You won’t believe the transformation! 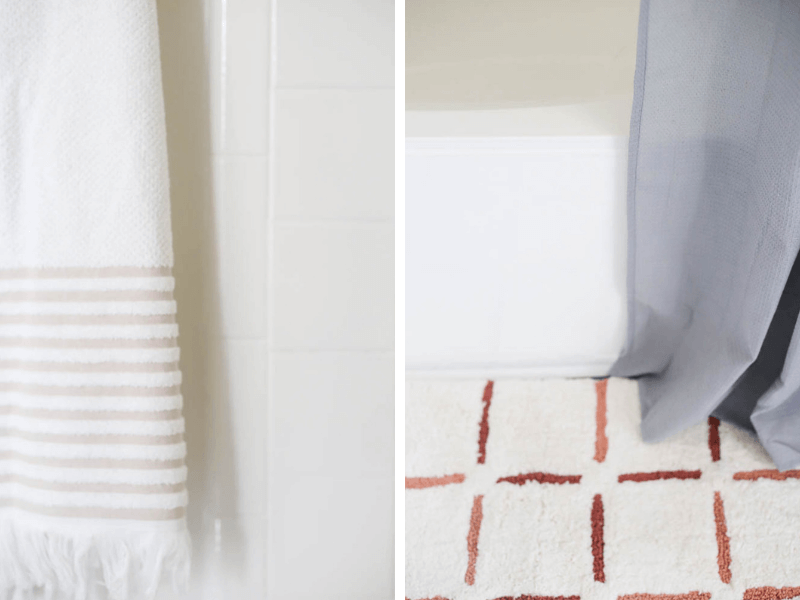 Over the last few weeks, we’ve been slowly and steadily working on giving our master bathroom a mini makeover. If you saw the before, then you’ll know that it was pretty desperately in need of it! 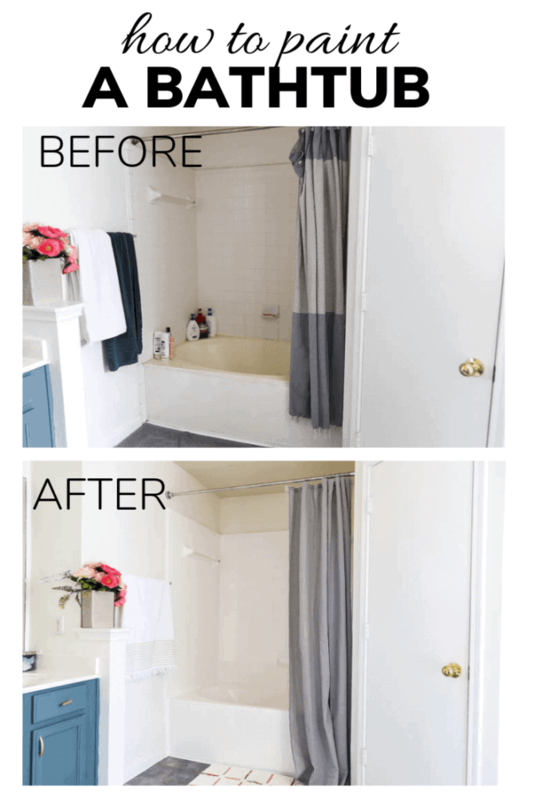 We don’t plan on doing a complete renovation of this bathroom anytime soon (and, in fact, may never get around to it before we move), so this is a great way to make the bathroom look a little nicer without shelling out a ton of money. We started by giving the vanity a makeover using Rust-Oleum’s Cabinet Transformations Kit. Next, we installed some open shelving above the toilet and painted the bathroom. 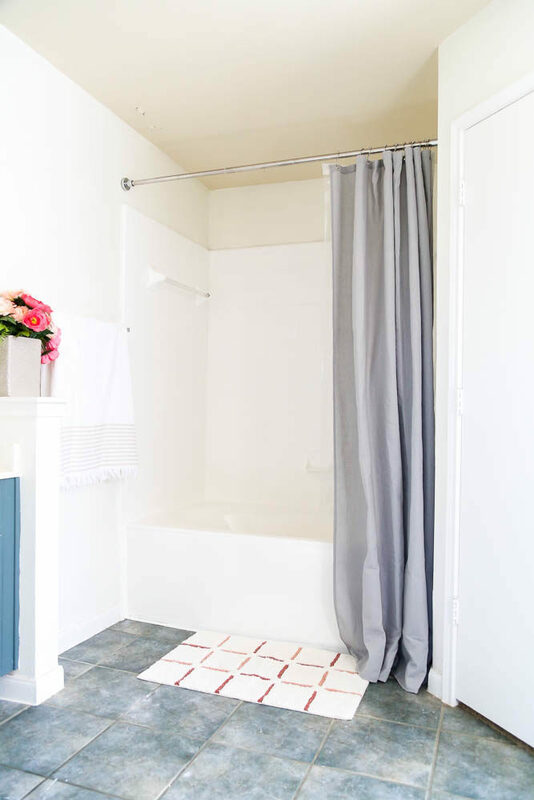 Today we’re chatting all about how I painted our bathtub and shower surround using Rust-Oleum’s Tub & Tile Refinishing Kit. After this, we’re going to be stenciling the tile floor, framing out the mirror, and adding a fun treatment to the ceiling that’s really going to cozy up the space. 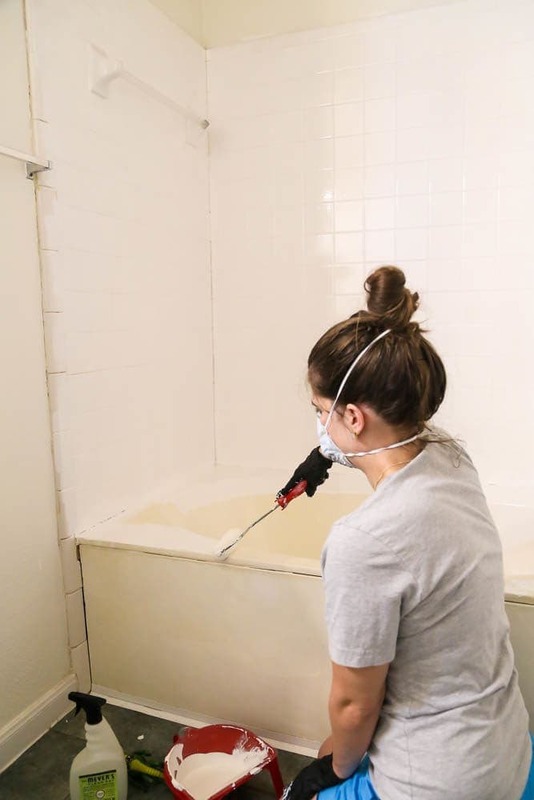 Refinishing your bathtub is one of those projects that seems incredibly intimidating if you aren’t super comfortable with DIY. I want to take a moment to assure you that it’s not that hard. As long as you follow the directions and take your time, you will end up with a gorgeous result that will fool everyone into thinking your tub has always been bright and shiny. My favorite thing about this project is how absolutely affordable it is to completely change the look of your bathtub. The kit only costs about $25 and covers a standard-sized tub. We have a garden tub (and I was applying the epoxy to the tile as well), so I ended up using three kits. I could have easily gotten away with just two if I had waited a little longer between the first and second coat (I had to do three coats on the bathtub, which is why I needed the third kit), but $75 for a project this transformative is so good it’s silly! Now, I’ll admit – our bathtub wasn’t as offensive as some I’ve seen. When we were in college we had a bathroom with a mustard yellow tub! 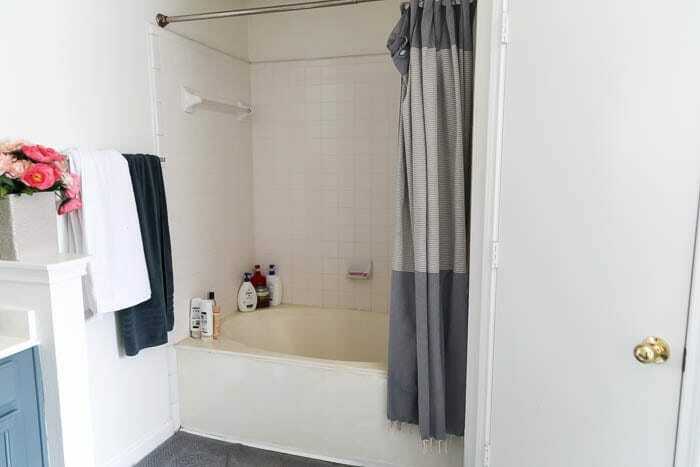 If you squint at photos of our bathroom before, you might not notice the weird, off-white, marble-textured tub that we have, but in person it’s pretty jarring. I was really excited to see if we could spruce it up, and this kit brightened everything up significantly. This project took me about three days to complete. If you don’t have a five-year-old and a teething baby in your house, you could probably knock it out in just one. I spent the first day removing caulk and cleaning the bathtub in-between Grant’s naps, then after letting everything fully dry overnight, I painted the tub on the second day. I ended up needing a third coat on my bathtub, and I had to wait 24 hours before applying it, so that’s why we had to tack on a third day to this project. The kit requires that you allow it to dry for a full three days before you shower in it again, so be aware of that before you start this project! If you don’t have a secondary bathroom, plan on borrowing a friend’s shower or heading to the gym to clean up. Or, you know, just embrace the stink. It’ll make your first shower in your newly-refinished tub that much sweeter. Okay, let’s do this. Here’s a reminder of what our tub looked like BEFORE I got started. 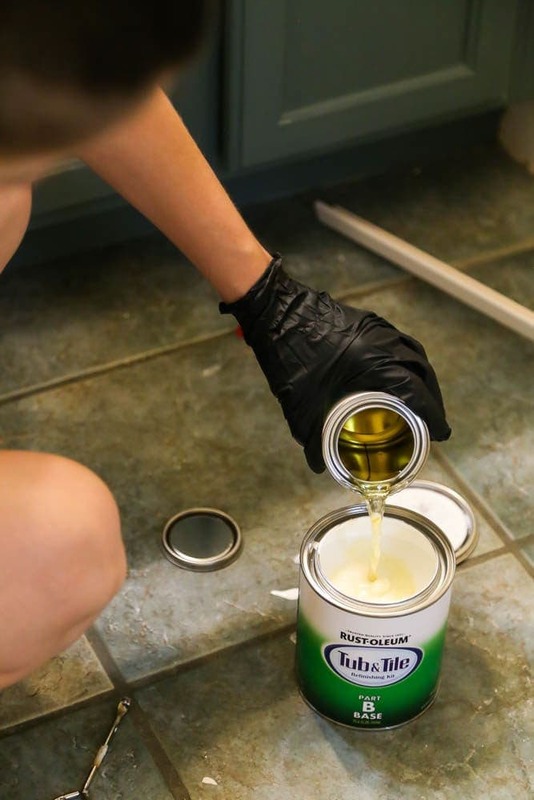 Note: In this post, I detail the steps for using Rust-Oleum’s Tub and Tile Refinishing Kit. Please feel free to use this as a reference, but please do NOT attempt this project without fully reading the instructions that come with the kit! The directions state that you should clean the tub before removing the caulk, but I knew I was going to make a giant mess removing the caulk anyways, so I decided to tackle that first. To remove the caulk, I just used a sharp razor blade and ran it along either side of the caulk, then peeled it up. This sounds incredibly simple and quick, and it’s not difficult (at all! ), but it will definitely require some elbow grease! I’d estimate that it took me about 40 minutes to remove all of the caulk around the bathtub. Just put on a good podcast and tell yourself that you’re getting your strength training workout in for the day. Once your caulk has been removed, it’s time to clean. 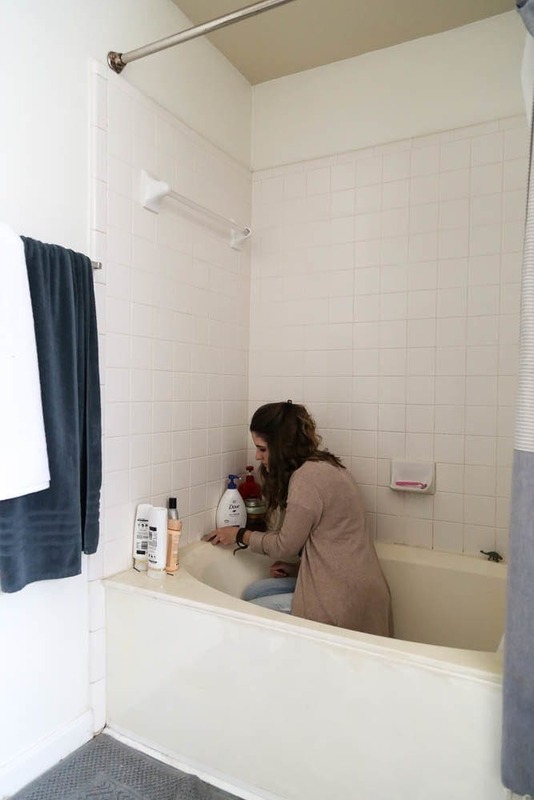 You’ll need to thoroughly clean your tub (Rust-Oleum recommends using a mix of bleach and water) and make sure to get up any mildew or soap scum. After your first round of cleaning is finished, sand the entire tub and tile area with 400 (or 600) grit sandpaper. I just sanded it by hand, but if you’ve got a power sander on hand that would probably be more effective. Please note: Don’t skip the sanding step! If you don’t have a power sander that’s fine (that’s exactly why I didn’t use mine – to make sure it would work if you wanted to do it by hand). The whole point of the sanding it to knock some of the glossiness off the tub and tile and prepare it to accept the epoxy. This step is vital! After sanding, rinse everything off and clean it again. You want the tub to be the cleanest you’ve ever seen it, because you don’t want to paint any dirt or hair into the bathtub. If you do, it’ll be stuck there forever! Allow the bathtub to fully dry before painting it (I wiped mine down with a towel once I finished cleaning to speed up the drying process). Here’s where I’ll make a note about the smell of this epoxy: It’s strong! Be sure that you’re wearing a mask while you work, and I would even recommend some protective eyewear if you’re sensitive to this stuff (I almost never wear a mask because I hate how they feel, but I wouldn’t have survived without mine!). You’ll also want to open a window in the bathroom and if you’ve got a standing fan, place it in front of the window to help the fumes escape the room. I kept the bathroom door closed while I worked, but of course some of the smell did escape to the rest of the house. We found that the best way to keep it from bothering us was to open the windows throughout the house and light a few candles. After about an hour or so, it wasn’t even noticeable! Even better? Do your painting first thing in the morning, then have the whole family head out for some errands – leave a couple of windows open while you’re gone and let the house air out. 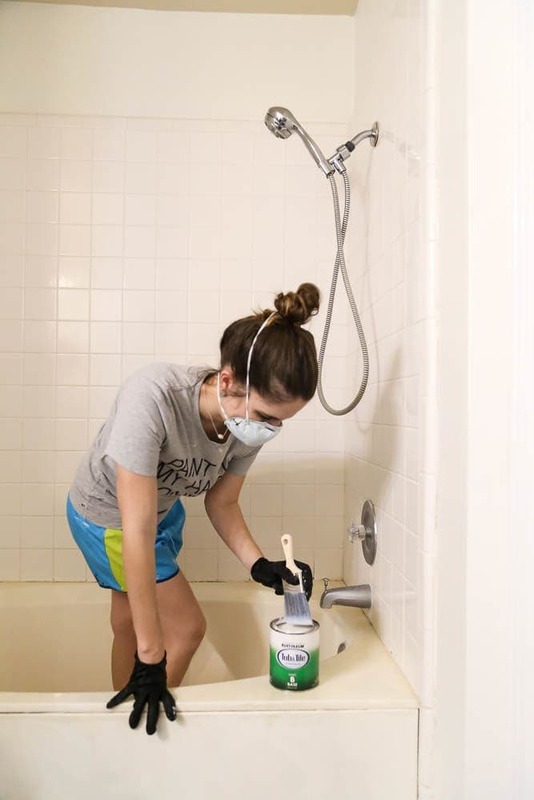 The tub and tile refinishing kit comes with a two-part epoxy. You’ll open both of them, stir them, and then mix them together. You’ll probably notice that the mixture is thinner than regular paint – I was surprised! The key is that you have to stir the epoxy for a minimum of two full minutes before you try to paint with it! The box isn’t specific about how long to stir for, and it technically doesn’t require any wait time before painting, but I found that stirring for a good 2-3 minutes was the best way to get the mixture to thicken up enough that it didn’t drip while I was painting. Step Three: Start Painting Your Tub! This is the part where, if you’re anything like me, you’ll start having panic attacks right before you start. I mean, this is a big project. Tubs aren’t easy to replace. Projects like this can be intimidating – I get it. The best way to get over that fear is to just dip your brush in the paint and DO IT. Once you’ve brushed a bit on, it’s too late to go back so you might as well move forward. I give you permission to even close your eyes for that first brushstroke. But please open them up afterwards so you don’t make a mess. You’ll want to use a foam roller or a really high-quality paintbrush to paint your tub. You could use a paint sprayer (it’s honestly probably the best way to get a totally smooth finish) but I didn’t quite trust myself with spraying epoxy in my bathroom. I’m just a bit too accident prone. Try to convince yourself that painting your tub is just like painting a wall or a piece of furniture. Nothing to stress about, just a little stinkier than normal. Be sure to cover up or remove and drains or metal pieces that you don’t want to accidentally get epoxy on (full disclosure: I skipped this step and have a bit of paint on my drain now. Whoops!). After you’ve finished the first coat, the box recommends you wait an hour before doing the second. I found that an hour was great for the tile and the outside of the tub, but when I stepped in the tub to reach the top of the tile, I smudged the epoxy a bit. I think a lot of it has to do with the temperature and climate that you’re working in, so I’d recommend giving it two hours before doing the second coat, just to be on the safe side! The epoxy has a working time of 6 hours before you need to toss it, so you don’t have to rush. Because of my smudging, I did have to do a third coat on the tub – if you need a third coat, you have to wait 24 hours before adding it. The directions actually don’t note exactly how long to wait before re-caulking. You have to wait three days after painting before exposing the bathtub to water, but it says that the epoxy is cured after 18 hours. So, I split the difference and waited two days between finishing my last coat of paint and re-caulking the tub. Thursday: First shower in the newly painted tub! We had to use our kids’ bathroom for a few days while everything cured, and let me tell you, it felt good to be back in our bathroom when all was said and done! Of course, we’ll only get to enjoy it for a couple of weeks before we have to vacate our bathroom again so we can paint the tile. It’ll all be worth it in the end, though! I’m so, so incredibly pleased with how this turned out, and I am so glad we did it. 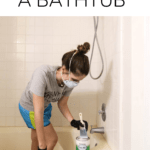 Until I started researching this, I had no idea it was even possible to paint a bathtub at home, and now I know that not only is it possible, it’s totally affordable and not all that difficult! 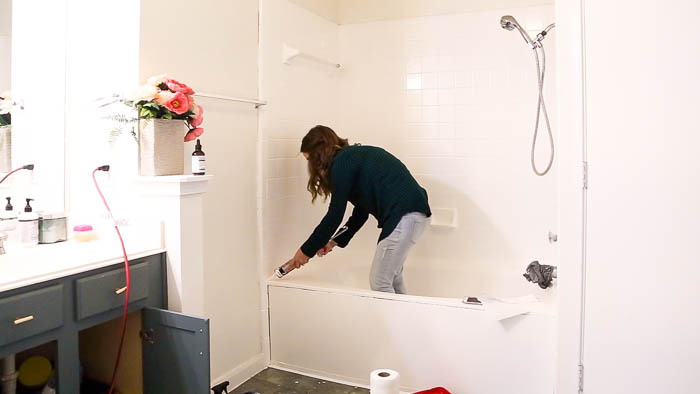 Let me know if you have any questions about Rust-Oleum’s Tub & Tile Refinishing kit, and be sure to check out their website for more information (and a how-to video). I can’t speak to the longevity of this yet, but based on what I know about Rust-Oleum’s other epoxy and paint products I feel confident it’ll last us a long time. Can you use this paint to paint over the non-slip strips that are in the bottom of the tub? These don’t look like they come off (ie the non slip strips are not stickers), so I’m hoping to just paint right over them. If they’re a part of the tub, then yes, it should be fine! You had to paint over a few days but said it had to be tossed in 6 hours. Could you clarify this, please? TY…your project looks amazing! Hi so I have a tub that has been destroyed by some kind of chemical my husband used to clean the drain. It is really rough ( the texture of the tub is like sand paper) there is no shine or smoothness to the tub. Can I use this product to restore the shine and smoothness of the tub. Hi, Dee! I’d imagine the tub would need to be sanded down to remove the rough texture, but after that, yes this will absolutely restore the color and shine! Looks so good! 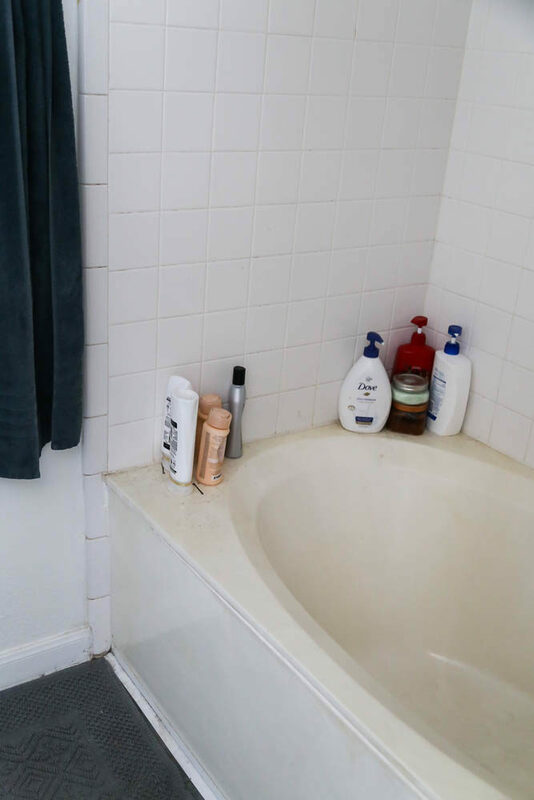 Did you paint over the grout between the tiles, too? Or how did you handle that? Thanks, Jessica! Yes, I painted right over the grout. It basically just looks like white tile with white grout now, and since it’s epoxy it’ll be a lot easier to clean! Will this work on enamel tubs, like a claw foot tub? Yes, it should definitely work! It looks great! That’s an easy way to spruce up a bathroom. I would like the paint my bathrooms walls and now you’ve got me thinking I should paint me tub as well. 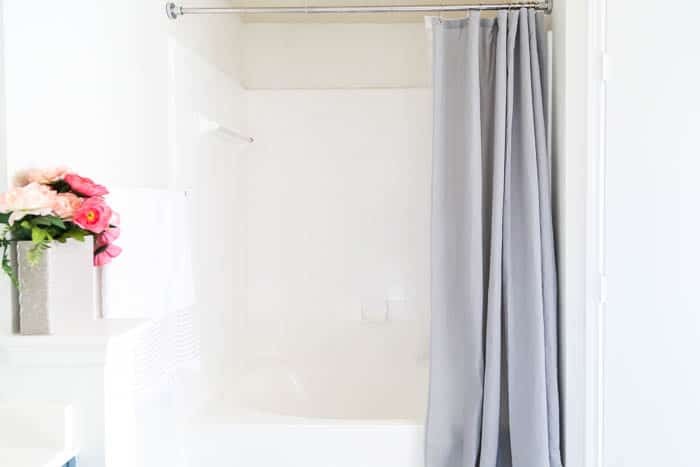 I saw an article related to choosing bathroom colors for walls and cabinets that was quiet interesting too https://blog.mykukun.com/choosing-bathroom-colors-for-walls-and-cabinets/ Really well done, your tub looks brand new 🙂 thanks for the inspiration! Will this work for fiberglass tubs and surrounds? We’ve been here 28 yrs and would like to give this a try. Yes, it will absolutely work for fiberglass! 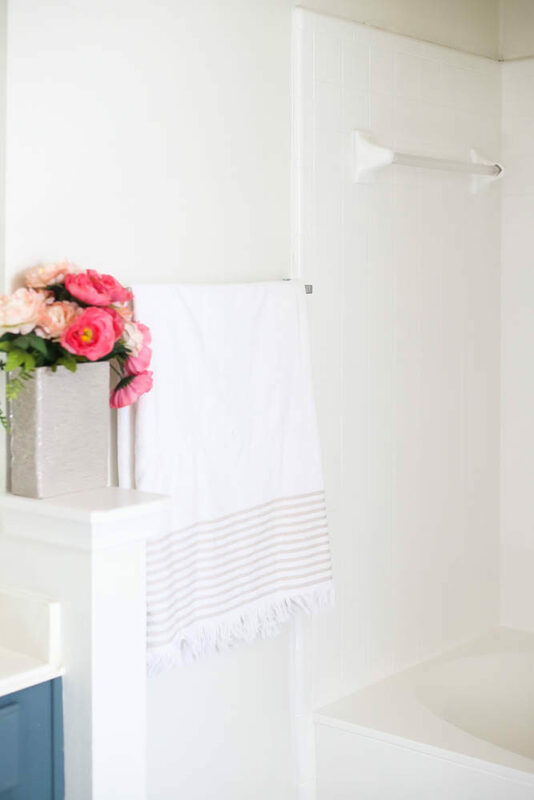 The revamped bathroom looks truly gorgeous, Amanda! Plus, I like how you use the negative space in a small area. The vanity goes really well with the decor. Thanks for sharing! It looks SO much better!!!! I’m dying to know how this holds up! We bought a house that was “updated” by a flipper whose style was distinctly from 1998. So our bathrooms have a faux-travertine tile that is sooooo dated. I talked to my husband about possibly painting it because we can’t afford a re-tile at the moment, but he was concerned about longevity. If this holds up even a few months of regular use, it would be totally worth it to try on our guest bathroom that hardly gets any use.